On a hot Summer evening, a small crowd of faithful writers braved the sweltering July heat and gathered in the Basement at the Richardson Public Library for the debut of “Separating Your Blog from the Herd“. 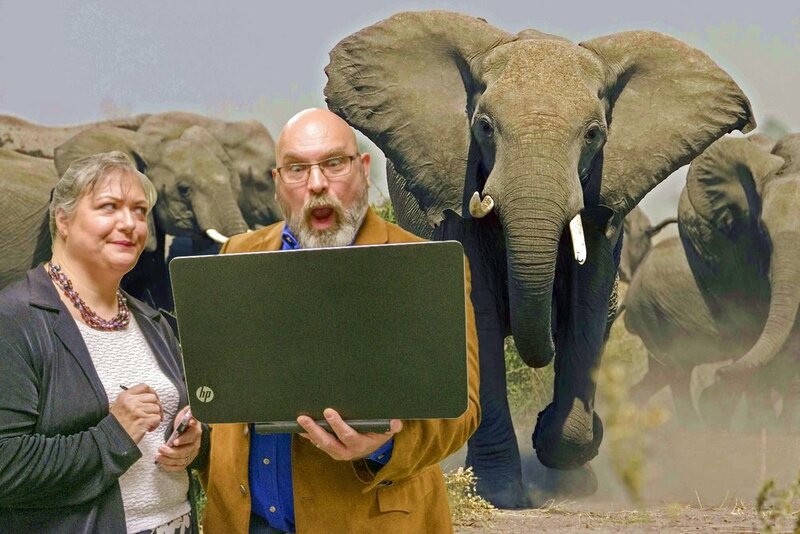 “Separating Your Blog from the Herd” is a presentation put together by my fellow blogging cohort Kathryn McClatchy and myself in an effort to share our blogging experiences and insights with fellow bloggers. The Writers Guild of Texas was gracious enough to host our debut event. Some of the folks in our audience were considering starting a blog for the first time, while others had a considerable amount of experience in blogging but were interested in learning new ways to improve their content, increase traffic, and improve reader engagement. Blogging is a legitimate and viable 21st century form of writing. If you like to create and communicate, blogging is an endeavor you can begin right now with very little, if any, financial investment (you’ll need a computer of course). You can express your ideas, share your favorite recipes, tell people about a great book your read or movie that kept you pinned to the edge of your seat. Honestly, you can blog about anything you want. Your content is totally up to you. Humans love to create and communicate. Having blogged for nearly a decade now, I have learned a lot since my first blog post. Most of it the hard way, through trial and error. So has my friend Kathryn. In putting our presentation together, we sought to communicate the relevancy of blogging as a writing medium and share our blogging journey with others so that they might benefit from our experience. All in all, we had a great time and even a few laughs. The crowd was highly engaged, asked superb questions, and interested in learning more about blogging. We are grateful to our friends at the WGT for inviting us. Personally, I’m also grateful for my cohort, Kathryn, who put in a lot of time and effort to ensure we had great content to present. Thanks to the advancements of technology, we were able to collaborate virtually and work together as a virtual team in preparing for this fun event. Some images courtesy of Pixabay. It was fun! And I think we proved again that writing is not a solitary endeavor. We both learned some new things about working virtually, and WGT members walked away with some new ideas that they can implement immediately. I would say it’s a win-win across-the-board. Thanks for suggesting we do this, and for making it a success. Yes indeed! Their questions were superb. Blogging is a legitimate and viable 21st century form of writing. Great point. I would only add that is is also a very legitimate Ministry for Christians as well, although not everybody is on board with that, seeming to treat is sort of dismissively. I agree Wally. Blogging is an effective ministry tool. Thanks for your encouraging feedback. Hi Anita. Good for you! I’m happy to help you but the presentation itself is proprietary and shared by me and my cohort Kathryn. You are welcome to email me at rbantau@me.com. I’m happy to answer questions you have. Be sure to include your church blog address too. Thanks for your generous feedback. I just sent you an email 🙂 Thanks again! Missed the announcement by RPL about this event. I would have loved to have been there. If you do it again, please let me know! Thanks Ann! My cohort Kathryn and I plan on doing similar presentations about blogging in the future. I’ll be sure to let you know of any future dates. Looking back at 2017, one of the coolest things that happened was having the opportunity to share about blogging and digital media with the Writers Guild of Texas alongside fellow blogger/writer Kathryn McClatchy.